They could maybe do with a touch up next time I take it down. 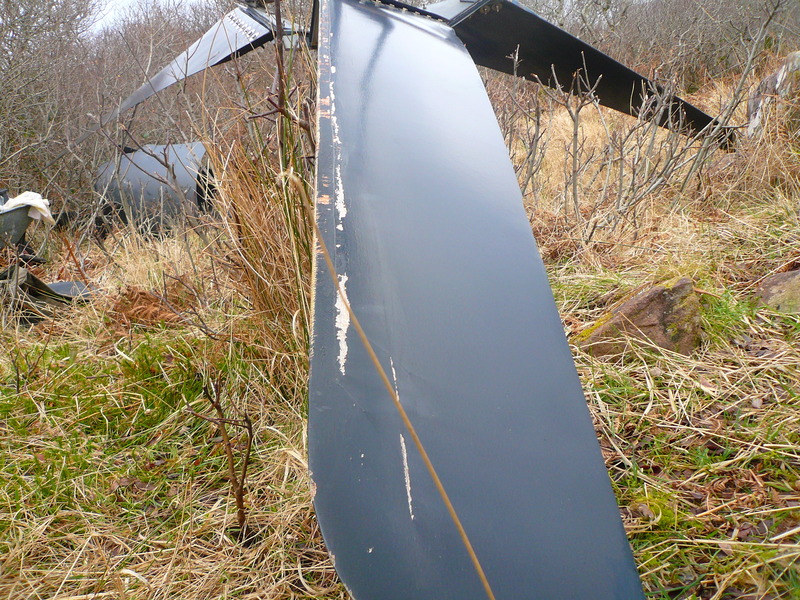 Made in Scoraig, these blades were the only type used in the Proven 6kW for many years until the new plastic ones appeared quite recently. So far as I know you need to pull off the magnet rotors and the stator to strip the machine. Strong forces involved and the magnets can be quite dangerous if things go wrong. You can lose a finger or worse. You need a strong puller to remove the first rotor and also to pull off the stator. Even the second rotor may be stiff to extract but at least you don’t have magnetism to contend with. Then putting it back together you will have to mind your fingers especially. Update, I had my installer come out to replace the slips rings with a refurbished set, I do not have a lathe or any proper equipment to refinish them myself, Hopefully they will last for another 5 years at least. Five years would be a very short life for the sliprings. I hope they were installed with some regard for alignment, and free of grit and grease. Thanks Hugh, I’ll try to get it sorted out in the next couple of weeks, do you know how the slip rings are removed? You may wish to dismount the whole brush assembly first. Use a 3mm allen key to loosen the grub screws deep within holes in the plastic body. Then you can pull it off the tower top spigot. Remove the cable, but don’t lose it down the tower. Would it be dangerous to leave it like that, as in could it cause more damage to the rest of the turbine, or will it just reduce its efficiency until it is repaired? Personally I’d deal with it straight away but if it fails then the turbine will not come to harm. It might just vibrate a bit loudly if one phase stops working. A healthy slipring or commutator has a smooth chocolate-coloured surface. Avoid scratching it, scoring it or changing the curvature in any way. Yours looks urgent to me, but if both brushes are working properly and the rough spot is limited, you might be OK to leave it. I took my 6KW Proven down yesterday to Service, most of the washers had worn away so I replaced those, also the inner pipe was worn through so it was replaced also thanks to your advice. I also noticed one of the slip ring was showing signs of corrosion and this is causing one of the brushes to wear down, do you know if these brushes can be replaced separately, also have you any idea how to replace the corrode slip ring? The marks are from arcing and sparking. I’d recommend putting it on a lathe. You need a very smooth finish, and the marks of sandpaper show much too coarse sanding. Very round and very smooth. It’s often best to leave sliprings alone but this one needs doing. finish it with the finest sandpaper you can find and clean it carefully to remvoe all sand. Great blog, I’ve just found it, I’ll be taking my Proven 6 down in the next for weeks, What is the spec of the nylon pneumatic hose pipe, diameter etc, I think I will need to get some spares in before I get it down. I bought the yaw rollers directly from Kingspan Wind. The washers for the spring ends are here http://uk.rs-online.com/web/p/products/0280543/ The bushes are nylon pneumatic hose pipe and I have a stock so I will send you some. I don’t know if Kingspan Wind sell to everybody but I expect so. They are a bit slow to respond or they could have sold me everything. Good to see your shed foundations happening.